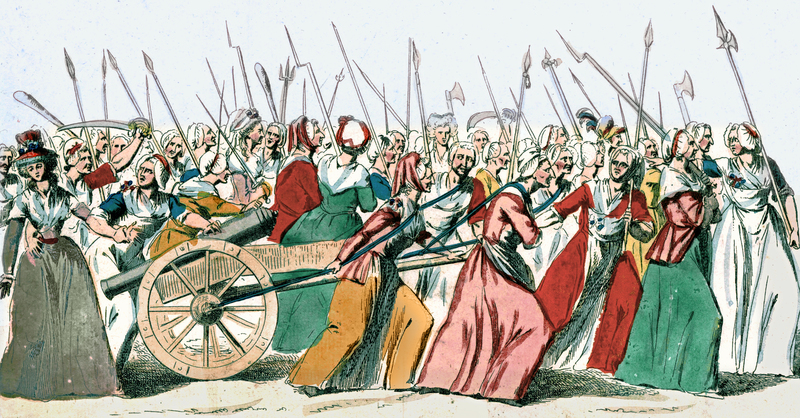 Women had no political rights in pre-Revolutionary France. They could not vote or hold office and were considered “passive citizens” because they had to let men make decisions for them. Their education in youth focused on teaching them to be committed to their husbands and cater to “all his interests.” Since much of the conversation at this time revolved around equality, the women became just as interested in keeping the change going. So when the rumors flew again about the King having troops invade Paris, many of the people spoke of a march on Versailles (13 miles away). stories that these troops had thrown the tricolor cockade on the floor and stomped on it. When the public heard this the amount of public outrage was amazingly intense, even compared to earlier issues. The women in the fish market would start the march toward Versailles that had been discussed so much in the previous weeks. They would start by attacking the Hôtel de Ville with a full 7-10 thousand people, taking bread and nearly burning the building down. After getting food, the crowd would march towards Versailles in the rain. When the National Guard heard of this they deserted the military to join the march even though Lafayette tried to talk them out of it. Lafayette would decide to join in to try to temper the craziness of the crowd, and try to talk the King into stopping the use of foreign troops for protection. Most of the crowd would come with makeshift weapons, but there were some people with guns and even a few cannons. The crowd would surround the palace and take over the Assembly with the goal of forcing the King to come to Paris where he could be monitored. The assembly tried to agree with their cause, but the crowd drowned out their speeches, refusing to let them speak. It was interesting that even though this crowd was highly upset, they were quite respectful when shouting for the King to come back. They had no such respect when talking to the Queen, who was called rude names often. Six women would be chosen as representatives of the crowd and allowed to enter to speak to the King about the demands of the crowd. The anger of the group seemed to melt at the sight of the King, being so amazed to be in his presence that one woman actually fainted at his feet. He would try to charm the women with food and carefully chosen words to make them feel as if he was truly listening to them. The news these women brought back pacified the crowd to a large extent, with a few people actually leaving at that point, but most of the crowd stayed, wanting more from this situation.